As you read in my previous e-mails, some friends of First Priority have gotten together to challenge the ministry to raise $100,000 by 11:59 p.m. on Monday, December 31, and they will match every penny donated! 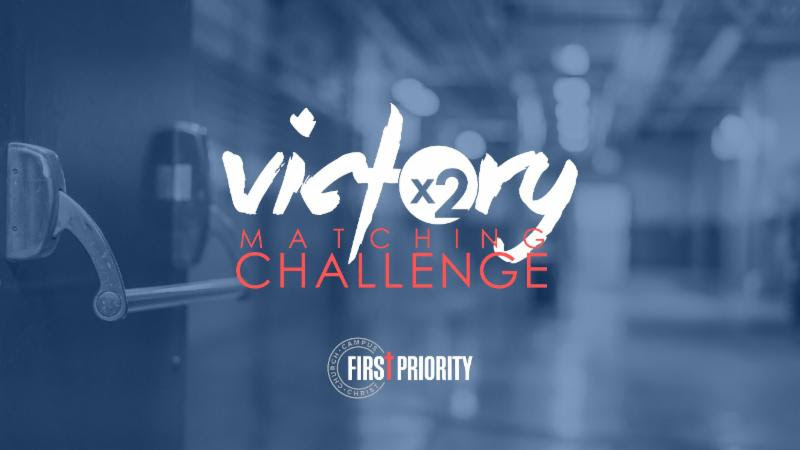 We would like to invite you to partner with First Priority and get involved in our Victory Matching Challenge campaign. But, hurry, tomorrow is the last day to have your gift DOUBLED! Students all across this city are hearing about Jesus in First Priority and FPKids clubs at their school. Every day on over 100 public school campuses across the Greater-Birmingham Area, First Priority student leaders have the privilege to share the Hope of Christ with their peers. But they can’t do this alone. First Priority students desperately need your prayers, help and support to reach this generation with the life-changing Gospel of Christ. If you have already given a gift, thank you for your generosity! If you haven’t given a gift yet, please let me take a moment to remind you that there’s no better way to continue your partnership with First Priority! Your gift of $25 will be immediately doubled to $50. Your $50 gift will be matched to make a $100 gift and $100 becomes $200. Your gift in any amount will have twice the impact in young lives during our 2018 Victory Matching Challenge campaign. Can I count on your support? In case you missed it, check out this video to see what First Priority looks like on campus! Please prayerfully consider sending a generous gift by 11:59 p.m. on Monday, December 31! A gift in any amount will be instantly doubled for twice the joy, twice the hope and twice the love to a student who so desperately needs to hear the Good News of Jesus Christ! Please let us hear from you soon! May God bless you this holiday season and throughout the new year!